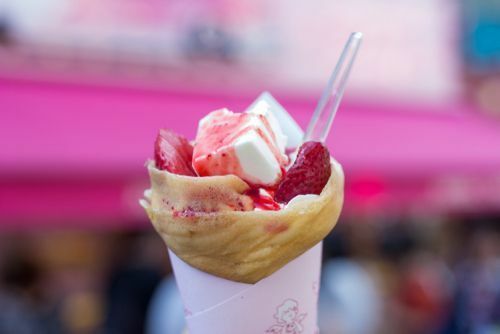 Known mostly for its uber-cute and alternative fashion styles, Harajuku has one more claim to fame - Crepes! Make sure to add this to your list of things to do in Harajuku and leave plenty of room to eat, 'cos these crepes can get pretty addictive. This is what has come to be known as the "Japanese crepe", a rolled up version of the French classic in which a very generous amount of various fillings is added. They first appeared in the mid-seventies in Harajuku where they keep becoming more popular over the years. Having a crepe is a must-do thing in Harajuku. Choices abound, so to make your life easier, we've made a guide of the best. Here's our selection of the best 9 places for the Japanese crepe in Harajuku. If you're interested in knowing how to make these crepes, check out the link below. Arguably the longest running creperie in Harajuku, Marion Crepes has been serving up delicious crepes since 1976! Starting from just a street-cart style shop it's grown so popular it has shops all throughout Japan, and even in China and US. They've geniusly combined an original crepe mix with a wide selection of fillings and toppings to keep customers coming back for more. Just a few minutes walk from Harajuku station and about half-way down Takeshita Street, this is definitely a spot not to miss! Crepes are between ¥200 and ¥520. The blueberry cheese one is our recommendation, and for the summer, why not try the seasonal choco-mint. They've recently started selling some bubble tea as well. Right across the Street from Marion Crepes is Angels Heart. They pitch themselves as the "Oldest Crepe Shop in Harajuku" and opened up in 1977. 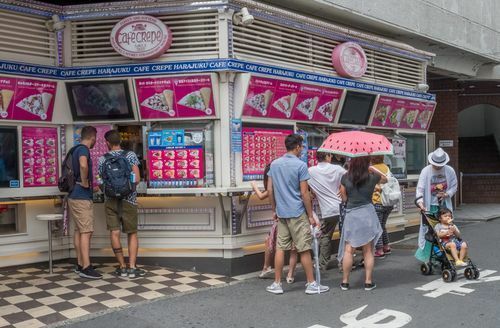 They were controversially the first to create the first Harajuku-style crepe with whipped cream, ice cream, and fresh fruits. Chocolate cake, whipped cream, and caramel sauce! Regardless of the controversy, their crepes are amazeballs! You'll generally see a long line waiting to order from the street, especially on weekends. Try the caramel nuts cheesecake for something rich that will satisfy the sharpest sweet tooth! If you happen to go to Angels Heart during the summer, you can have some kakigori (shaved ice) there as well. This is the quintessential Japanese treat during a hot summer day. Sister store of Angels Heart, Strawberry House also has a huge selection of toppings and fillings for their delicious crepes. Whether you're after a sweet or savory crepe they'll have one just right for you. Located right out of Laforet shopping mall and only a 2 min walk from the Omotesando Metro station. The shop occasionally has special collaborations through which awesome limited-time only crepes are created. The one above was created to celebrate the famous American fashion designer Anna Sui. The black crepe and its carefully selected toppings capture the essence of the designer's work apparently. Yes, this happens only in Harajuku! 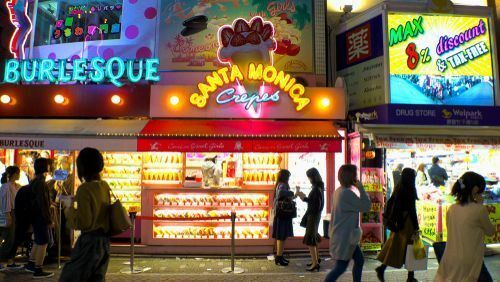 Santa Monica is another creperie is Harajuku that boasts over 100 different varieties of flavours and fillings! If you have a hard time deciding on which one go for the Strawberry Banana and Chocolate Ice cream crepe - it's their No.1 seller! They have two locations. The first in about halfway down Takeshita street, 4 mins from Harajuku station. The second store at the very end of same street. Apple pie + crepe = yum! It's kinda styled like a retro LA diner but without the girls on roller skates. They also serve Tapioca filled beverages that do go very well with their crepes so definitely give them a try! Sweet box has two stores on Takeshita street and only a few minutes from Harajuku station. They serve up fresh and delicious crepes like many of the other ones around town. However, if you feel like taking a bit of a break from walking, they have NOA Cafe next door where you can sit, eat, and people-watch while you enjoy a coffee and crepe. If you're having trouble deciding, give the Kiwi and cheesecake crepe a try! You won't be disappointed! If you're Gluten Free, you're gonna love this place 'cos they make their crepes with 100% local rice flour! Boom! Even if you're not Gluten Free it's still worth a visit as they fill all their crepes with the heavenly goodness: fresh cream, chocolate, strawberries, ice cream, nuts... and more! To get there, walk down Takeshita street and take your first left. Its just down the end of the street. New to Harajuku is Comcrepe - specialising in brulee-style crepes. It's tucked away on a side lane on Takeshita street just after you pass Thankyou Mart. They are truly next-level crepes and a must-try if you've ever had crepes before! Created by Pattissirie Chef Kei Hasegawa, he is certainly "upping" the level for the other creperies in town. The combination of lightly burned surface and the creamy brulee is extremely good! Looking for something new? Visit Comcrepe! Their signature brulee crepe is ¥650, and there are a couple of variations to it. Located almost in the center of Takeshita street, MOMI&TOY'S offers melting sweet crepes. Their selection stands out for having a couple of little irresistible gems such as the tiramisu cake filled crepe, which also has a matcha version. Also, the crepe dough itself is different because they add some almond flour to it. Unlike the other creperies around Harajuku, you can sit down and eat your crepes at MOMI&TOY'S. You can also order them for take-out and enjoy them outside. If you think that crepes are only desserts your completely wrong. At MOMI&TOY'S, you also get a chance to try some meal crepes such as salad crepes! They also serve bubble teas and fruit drinks. Parla Labo is a satellite shop of the high-end Ginza creperie. This one isn't located on the Takeshita Street of Harajuku, but rather on a back street on the west side of Omotesando boulevard. As its name implies it's a laboratory of sorts for creating new types of original crepes, and their selection doesn't disappoint! For instance, they served a blue cheese and fig crepe for a limited time. The "experiments" are generally the most interesting items to try. For a more refined kind of gorgeous crepe, this might be the best place to go to. Harajuku is a must visit place for all crepe lovers! Aren't you longing for some sweet crepes now? If so, Harajuku is the only place you can visit! There are many different creperie in Harajuku which each of them offer really astonishing crepes!